Nik’s Chicks is a FREE ladies only running/triathlon group. It is only a time and place to meet & a program to follow. I cannot join you on every run/workout. If you are new to exercising, it is advisable to have a doctor’s OK prior to beginning. Please sign my waiver (in “About”) and fill out my contact info sheet when you arrive for your first run. I think there is no better way to invite a human being to view their body differently than by inviting them to be an athlete, by revering one’s body as an instrument rather than just an ornament. It’s a really great way to reorient how you see your body so you can see it as this incredible, awe-inspiring machine that you need to fuel well in order for it to function. Hello ladies, here is the latest news from the “nest”! Weekly Chirp: With school ending on Thursday, some of you will find yourself in a position where your spare time (time for exercise) is limited. In the past you may have placed your own activity on a shelf until September, when the kids went back! Why not make this the summer that you stay committed to your own health and wellness? It might take some planning and creativity to make it happen…but aren’t you worth it?! Here are some ideas to help you: 1) Enlist an older sibling to watch younger ones while you train. Ensure they are prepared (has your cell #, neighbor’s #, knows house rules and location of first aid box, etc.) Start with short “escapes” of 30 minutes and gradually lengthen. Praise and rewards help!! Babysitting courses for 11+ yr olds are offered twice a month through Red Cross in Oakville. Email cynthia.higgins@redcross.ca for more info. 2) Hire a nearby student to watch kids for a nominal fee. Make sure they are prepared as well. 3) Swap babysitting time with a like-minded mom. Take turns watching each other’s kids while you work out. 4) Attend a gym that provides a child care service. 5) Switch workout times to before spouse leaves in am or after he gets home in pm. Make sure he understands how important it is to you that you carve out this time for yourself! 6) Take the kiddies along. Have them bike with you while you run – trips to the ice cream store after 30 minutes of them bikingis a big draw!! Let them wear the watch so you don’t hear “Are we done yet?” too many times! It may take some work initially to get your plans in order, but the rewards are sweet: Alone time, exercising to reduce stress and better health!! Give it a try! Happy Canada Day to everyone! Enjoy the long weekend with your families! New Learn to Run 5km and 10km, Half Marathon: New 5km and 10km programs began last Tuesday. If you were unable to get out due to heat, storms, etc., it’s not too late to start tonight. You can download and print the programs here: Learn to Run 5km Training Program and 10 Km program from 5km base . Email me for more information or to sign up: mclaughlins@cogeco.ca. (5km – Janice, Karen, 10km – Laura, Fofi, Angela, Celine) Remember that all Nik’s Chicks programs are FREE! If you are new to the group, please remember to fill out a waiver and contact info sheet – these will be on my front step. We start from 1438 Redwing Crt. It’s going to be warm so hydrate well before, during and after your run. Rebecca Run for Spinal Muscular Atrophy: On July 7th many girls in our group will be heading to Newmarket to take part in the 10th annual Rebecca Run. This is a 5km run around Fairy Lake to raise funds for SMA. This run is special because one of our Chicks, Cheryl, lost a son Max to this disease when he was only 6 weeks old. Her touching story can be found here Max’s Story. Take a moment to read it and watch the beautiful video. If you decide to do the run, you can register at http://www.events.runningroom.com/site/?raceId=7405 Sign up with team “Miles for Max”, I will be attending with my husband and 2 of my kids! Half Marathon Dreams? : Do you want to do a half Marathon this fall? There will be a large contingent of Chicks running in the Angus Glen Half Marathon on November 4 in Markham. This is a rural race with terrific post race buffet and entertainment inside the Golf Club! You need a 10km base by August 11. That means that you have started the Learn to Run 10km program last week! Start planning now to get out of your comfort zone…I have a few of you in mind as I write this!! Register here Angus Glen Half Marathon as soon as possible because there are ONLY 750 race spots available and it will sell out. By the way, for those of you determined to dig in your heels…there is a 5km and 10km run too! Brogan and I will both be running the half. Email me when you sign up so I can add your name to my race list. Triathlon Aspirations? : Some of you have been listening to recent stories of Chicks who have been completing Try a Tris and Sprint Tris and are probably wondering if you could do one too. The obvious answer is YES!! With a little bit of training (total 4-5hours a week) for 6-8 weeks, you could be comfortably prepared to do a try a tri or even a sprint! Consider the Lakeside (near Stratford/Oxford) Triathlon on September 15 (sprint races) and 16th (try a tri and olympic races). Swimming not your thing? There is a duathlon here too (run/bike/run). It would be a lot of fun to have a group of girls race together! If there is enough interest, I will put together a condensed training program which would begin mid-July. For more race info check out Lakeside Triathlon Give it some thought! These races are a lot of fun!! IT Band problems? : A recent article in the Globe and Mail suggests hip strengthening as opposed to stretching may help runners experiencing ITB syndrome. Read the full article here: ITB Article. 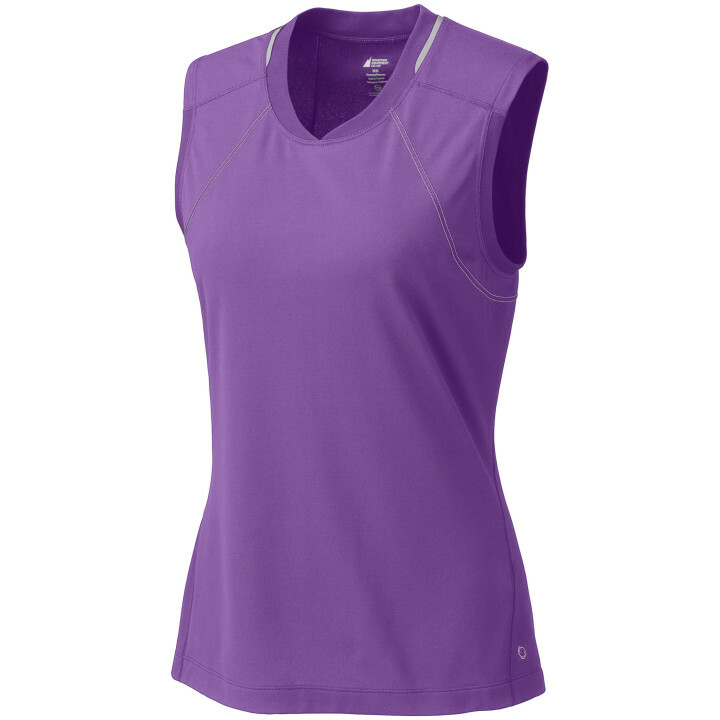 Tri Shirts: Do you have the perfect top for your first triathlon?! 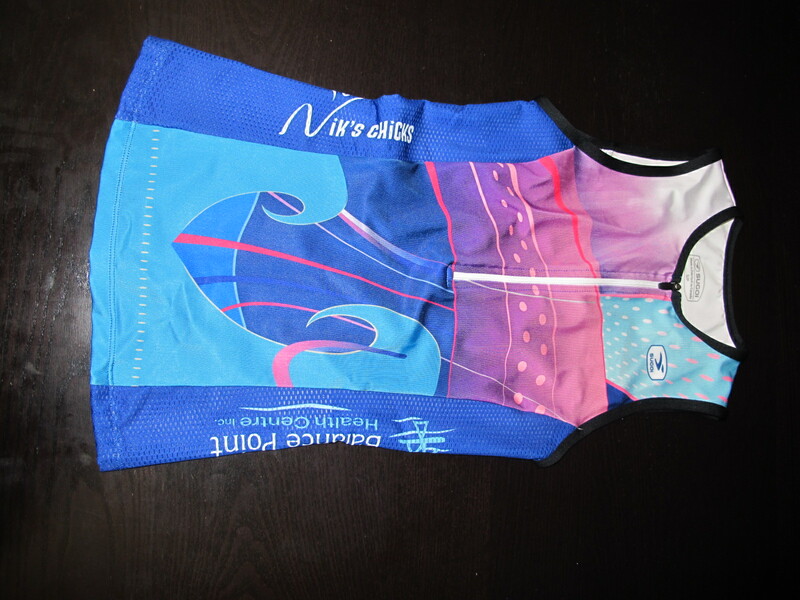 If not – consider a custom made Nik’s Chicks tri shirt!! You can take one home to try one on if you wish. Total cost will be 52.00 each, taxes in (similar styles sell for 70.00 – 90.00). I have 2 smalls, 3 mediums, 1 large and 1 x-larges in stock). If you have gotten a shirt from me to try and it works, please drop by a chequeor cash for 52.00. We wear these shirts under our wetsuits on race day. They fit snug (no chaffing) and have pockets on the back to hold gels/lip balm! Nik’s Chicks Sleeveless Tops: These are at the printer and will be ready by next week. final cost to be determined – will let you know in next week’s update. Cash (exact change) or cheques will be perfect. I have 60 shirts in stock, various sizes, and they will be available on first come first served basis. Tips from Runner’s World Daily Calendar: 1) Don’t head out the door to run right after you wake up. Allow time to eat (60-90 min) a bagel, energy bar or fruit and drink coffee, energy drink, water. Love your sleep? Wake up 30 min prior to running and drink water and eat sports gel 15-20 minutes before leaving! 2) As you gain fitness, gradually change your recovery days from rest only to cross training days. It will help build your aerobic development without increasing your injury risk. For 30-60 minutes ride a bike, use an elliptical, deep water running or swimming 3) Stash your sunscreen with a sports drink or carry a small container of it with you to reapply. Plan long runs so you can circle back to your car or house and spray on mid-route. 4) Eating small, frequent mini meals that include a lean protein, complex carbohydrate helps stabilize your blood sugar. This helps keep your metabolism and digestive tract humming and will make it easier to resist unhealthy snacks. 1/2 Ironman – 7am (time tentative) run 1hr 45 min with hills, others welcome! Wear Red and White!